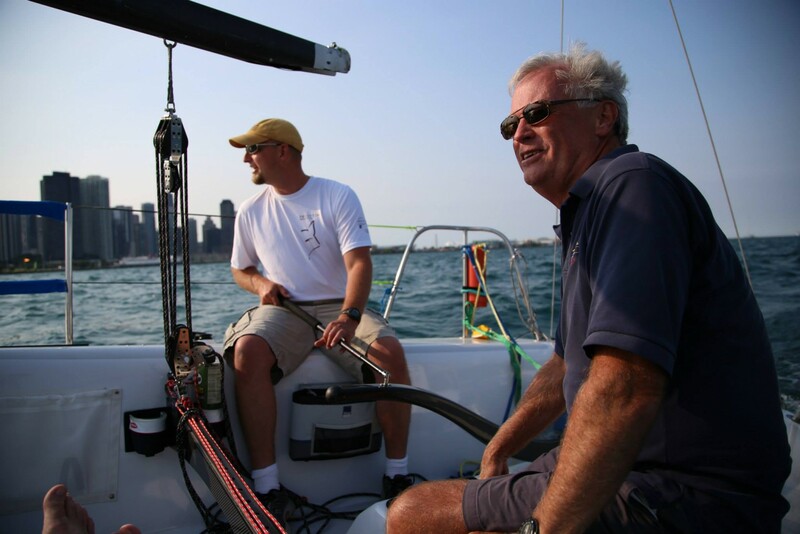 The Mainsheet and Traveler of the Olson 30 (and any sailboat) is arguably the most important set of sail controls on the boat. 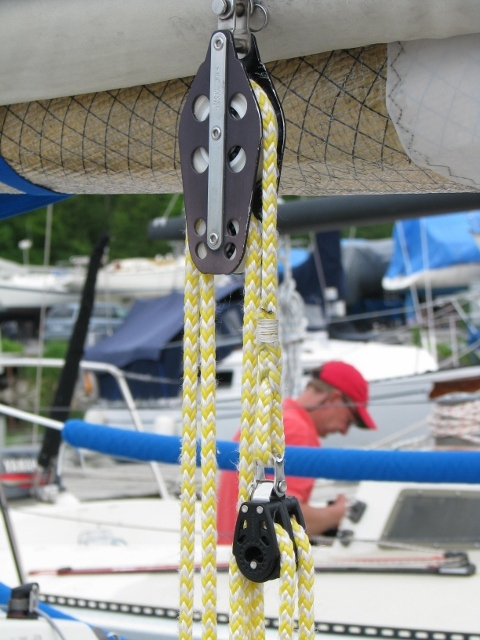 The original mainsheet is a 3:1 system with a continuous control line. 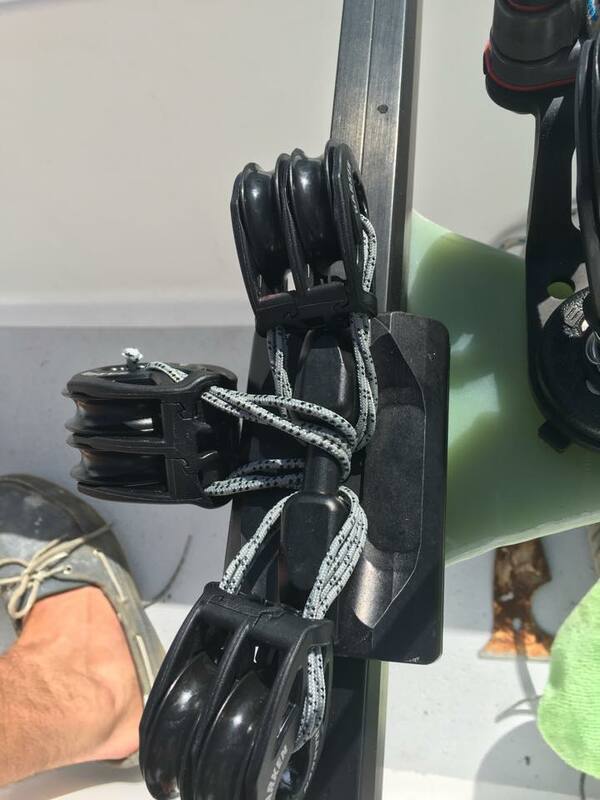 The original Mainsheet is a 4:1 with fiddle blocks top and bottom. 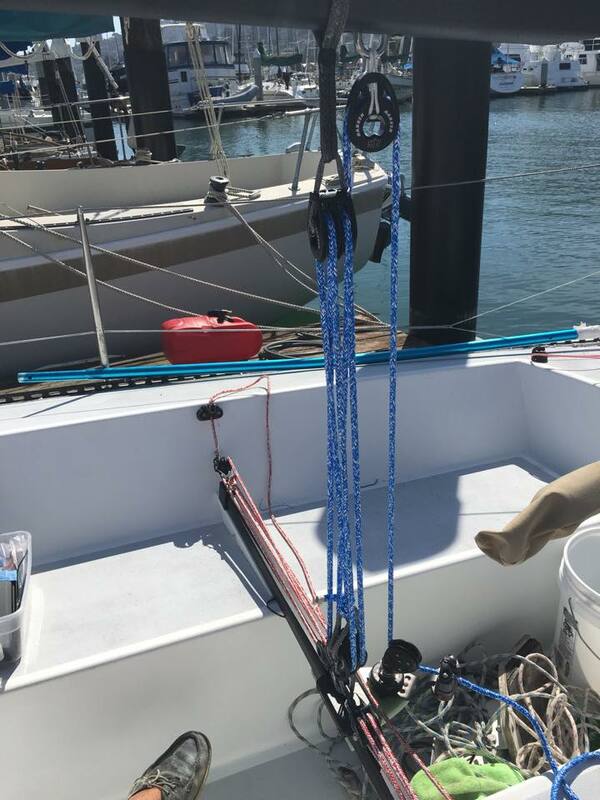 Both of these original systems are adequate but the Mainsheet especially lacks purchase in a breeze, and many modified boats use some form of fine/coarse adjustment to get more purchase, quicker payout or both. 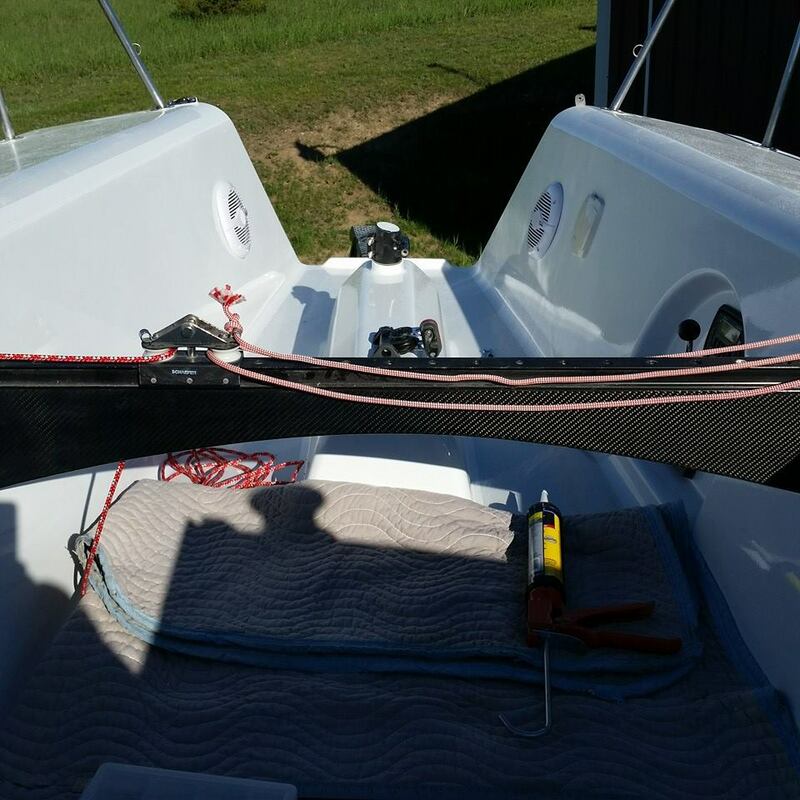 Old School used a Mainsheet with fine and coarse trim. The coarse was interesting in that it was on the forward side of the traveler instead of aft. Fine trim was aft. Coarse is 4:1 and fine is 16:1. 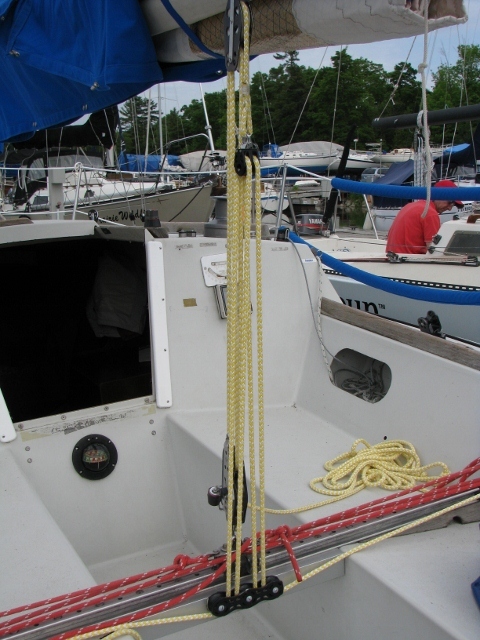 Another view of the Old School mainsheet. Aft yellow line is 16:1 fine tune. 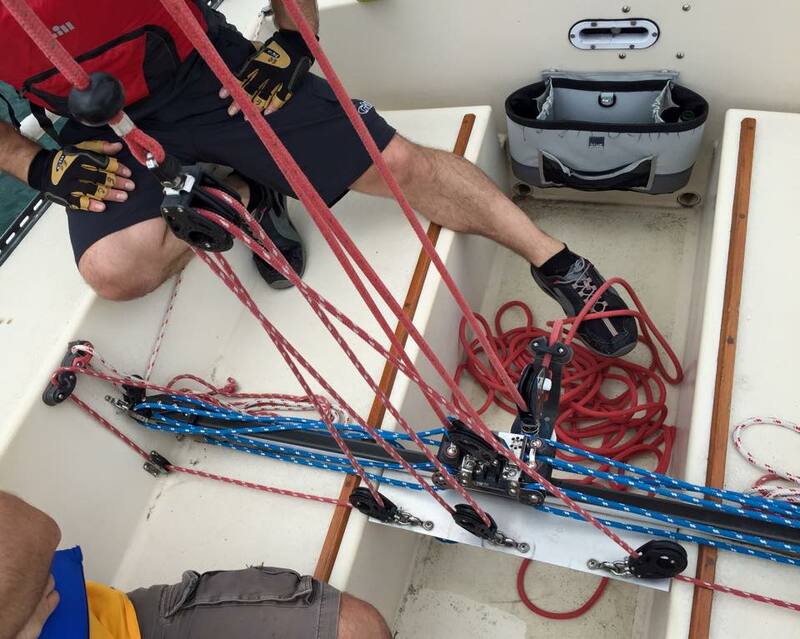 Centre line on cockpit edge is traveler, red line in forward cleat is backstay. 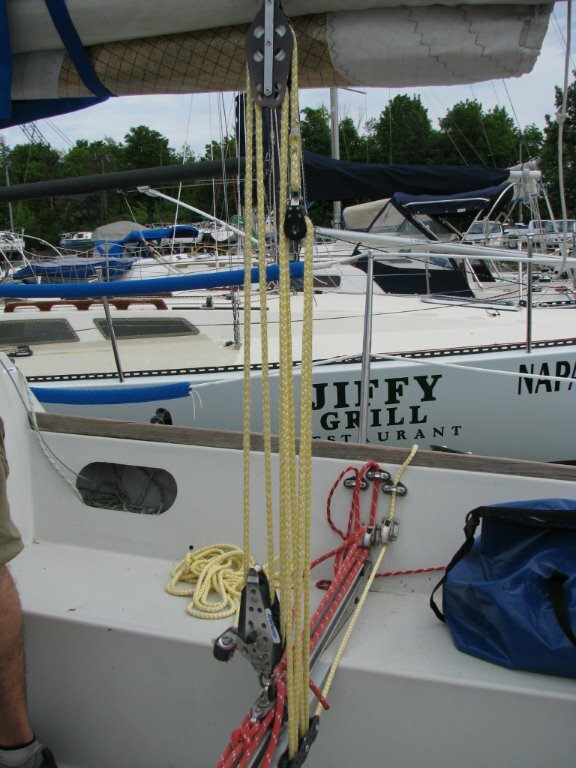 This system could be reversed so the 4:1 of the mainsheet faces aft. 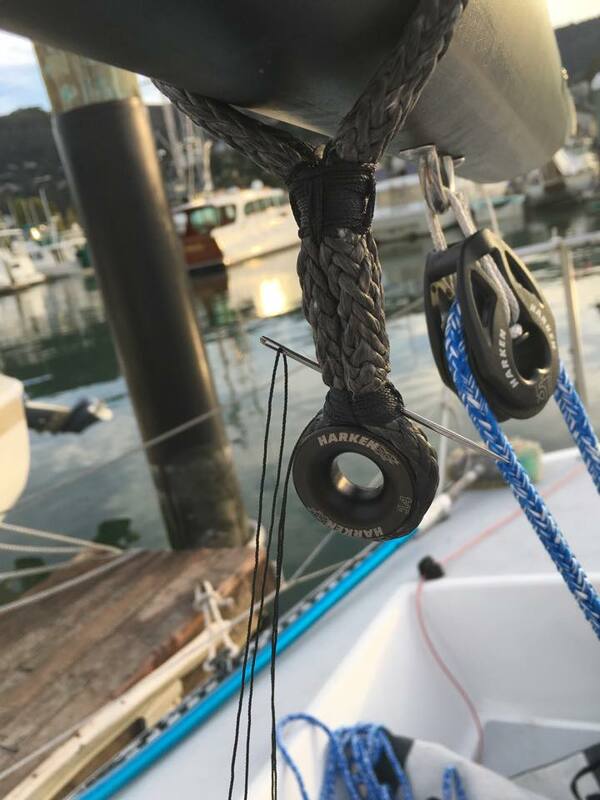 Stella Ray uses a Harken windward sheeting traveler and a modern mainsheet with fine and coarse. 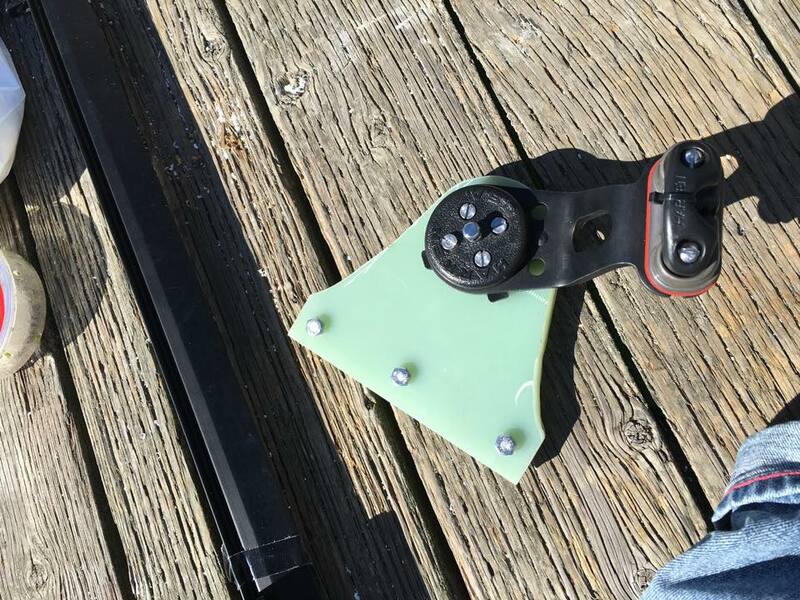 Gross adjustment of the mainsheet is mounted to a pivoting ratchet block, double-sided fine adjustments are independent and easy to trim from the rail due to being cleated on the edge of the cockpit. This system is probably one of the most flexible you could use on an Olson 30. Detail of Stella Ray’s mainsheet and traveler. 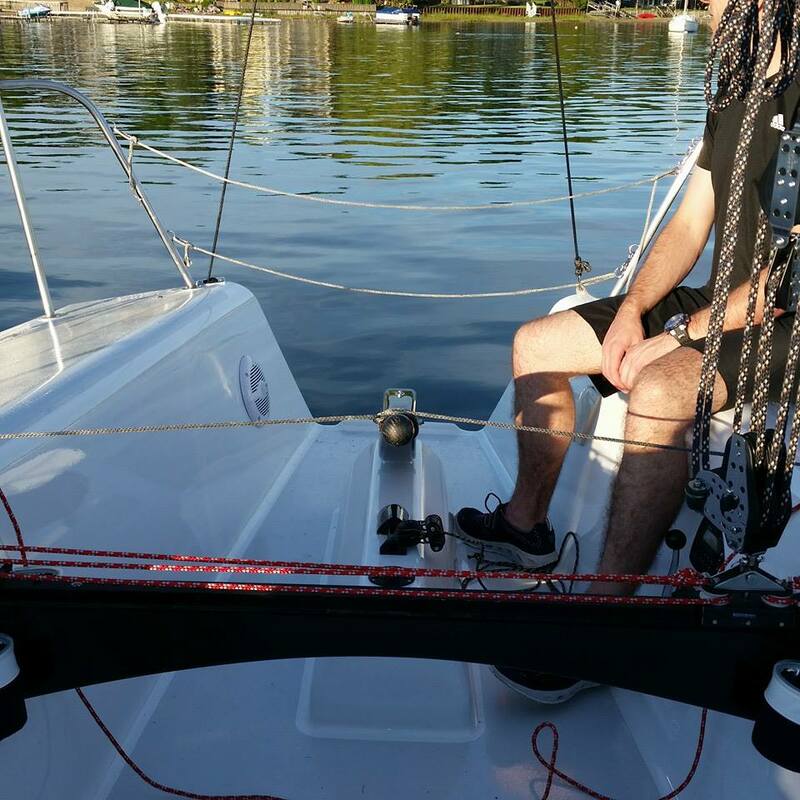 Traveler is Harken 4:1 windward sheeting style, Mainsheet is Coarse/Fine purchase is 4:1 / 16:1 with double-ended fine. 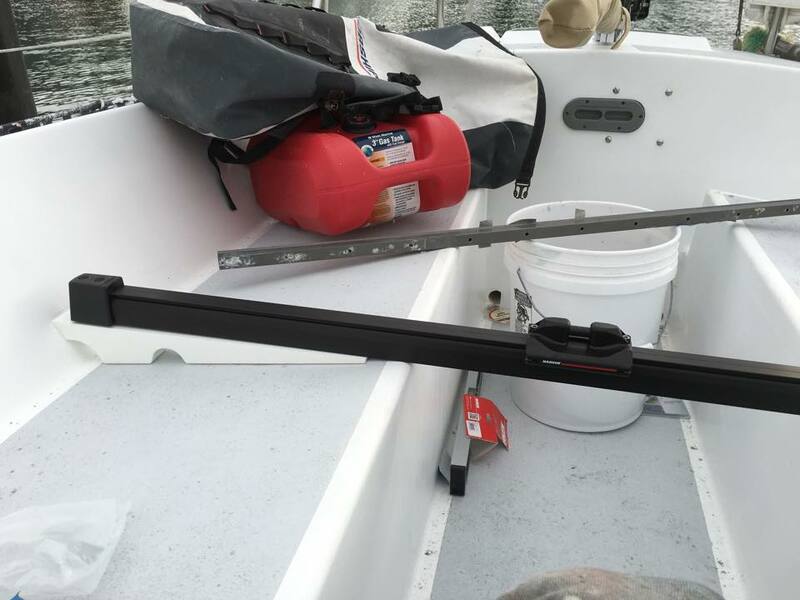 Note that with this type of Mainsheet there are modifications required to the bridge to allow mounting of the center cam base and tackle for the fine tune. Nothing like Winter Series sailing in Texas . . . it doesn’t get any better. Congrats to my crew for their commanding performance to win the series. Some highlights aboard “Stella Ray” from this past weekend on Canyon Lake. 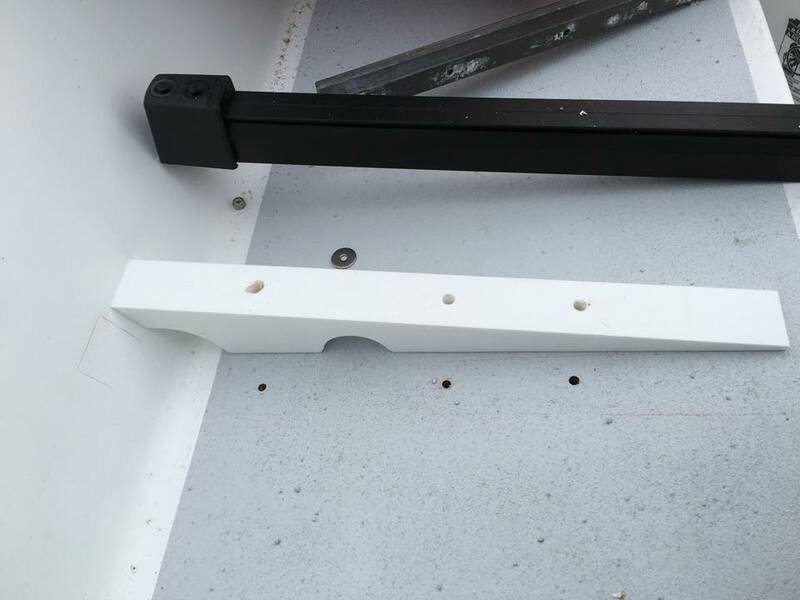 Spar Wars III mainsheet is a 3:1 / 6:1 system. Two lines and two purchases for fine and coarse adjustment. Spar Wars III has had extensive modifications to the traveler due to her open transom and new cockpit. Traveler bridge is now a carbon spar. Traveler itself is conventional Scheafer 3:1.